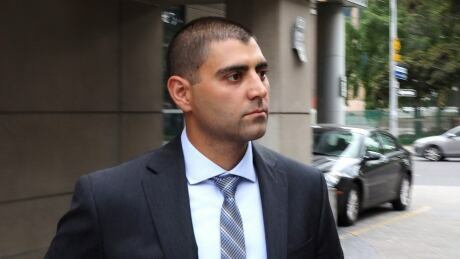 Peter Khill, who was acquitted of murder after he killed a Six Nations man on his property, has filed a statement of defence in a more than $2 million civil suit brought by the man's spouse and two young daughters. In court documents filed on Nov. 2, the Hamilton-area homeowner denies Jon Styres' family suffered the injuries, losses and damages described in their statement of claim and rejects most of the other points raised in the suit filed by Hamilton's Hooper Law Offices. Khill's statement of defence takes the same position as he did in his criminal trial, that he fired in self-defence. His civil case defence also claims he felt an "immediate threat of death and/or serious bodily harm" to both him and his wife when he woke up around 3 a.m. and saw someone had broken into his truck. The defence rejects the lawsuit's claim Khill fired "suddenly and without warning" and that he intentionally shot to kill the 29-year-old man from Ohsweken on the Six Nations of the Grand River reserve as he "fled." In his statement, Khill says he knew a garage door opener in his truck could be used by Styres to gain access to the house leaving him to fear a "potentially armed home invasion" was imminent. The defence adds Styres was "acting in a menacing and or threatening way." In their lawsuit, Styres' family said Khill made no attempt to contact the authorities before confronting him. But in his statement, Khill denies this, despite testifying during the criminal trial that his actions that night were dictated by his military training, which did not include calling 911. Brian Simo, the lawyer representing Khill, did not immediately respond to requests for comment on his client's defence. In the criminal trial, a jury found Khill, who is white, not guilty of second-degree murder and manslaughter in Styres' death. Public reaction to the verdict was deeply divided. Some some supported the decision, while others pointed to race as factor in the jury's decision despite each juror being screened for bias during the selection process. A jury with no visibly Indigenous jurors reached its not guilty verdict for Stanley in August 2016. The decision led to outrage across the country and a pledge from federal ministers and Prime Minister Justin Trudeau to change "systemic issues" in the justice system. Following the Khill verdict, Indigenous leaders and activists also called for changes to Canada's justice system and for the verdict to be appealed. Ontario Regional Chief RoseAnne Archibald issued a statement describing Styres as "another victim of senseless violence." "This sort of extreme violence – shooting an unarmed man – is not acceptable in Canada," she said. "No one should place the value of a possession over the sacred life of a human being." The lawsuit launched by Styres's spouse, Lindsay Hill and her two daughters was filed on Jan. 31, 2018. The damages are based on "mental distress," a loss of income and services from Styres as well as a loss of "care, guidance and companionship as the result of his death."